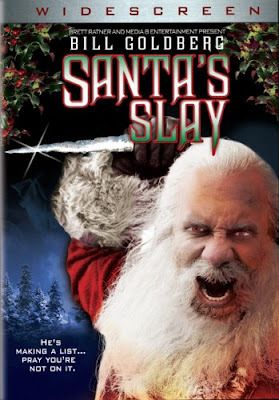 The fine folks at Exhumed Films recently had their "Ho-Ho-Horrors" double feature, and this was the first film. Director Lewis Jackson was there to introduce it (shown on his personal 35mm print - the only one in existence), and for a post-film Q&A. A reel of deleted scenes was also shown. Interesting stuff. Overall, I enjoyed it. 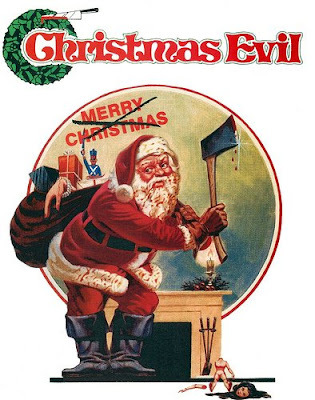 I wouldn't really call Christmas Evil (or You Better Watch Out, as Mr. Jackson originally titled it) a horror film, but it certainly is dark and disturbing. An odd little film. Worth seeing if odd little films appeal to you. Ah yes, the infamous slasher classic. This was the second half of the Exhumed double feature. I remember the controversy over this when it came out in 1984. Or at least I remember this being THE film my friends & I just HAD to find a way to see once it hit video stores a year or two later. Flash forward to 2008. It hasn't held up too well, although it does have some moments (the "antler" scene is, of course, an exploitation classic). But it sure was fun to see with a crowd. After hearing about this one for the past couple years, I decided to give it a shot. It's a stupid/fun movie, about 65% stupid, 35% stupid fun. Former wrestler & current MMA commentator Bill Goldberg is a killer Santa Claus, who visits the township of Hell to wreak some havoc. The amped-up bison-reindeer was a nice touch. Could've been better, could've been worse. Instead of a killer Santa, we have someone killing anyone dressed as Santa. The only word that comes to mind is dulllll. With 5 L's. Seriously - Avoid this if you can. Another one that fits into the stupid/fun category. 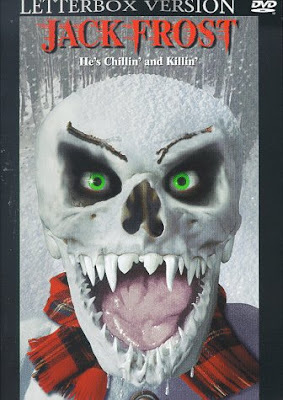 On the way to his execution, convicted murderer Jack Frost crosses paths with some experimental genetic material, and the snow outside, and mutates into a killer snowman. If they could have put some more money into the effects - specifically the snowman - this would have been more fun. But as it is, it's mostly stupid. And yet, I'd sit through 10 screenings of this before watching Don't Open Till Christmas again. Tales From The Darkside: "Seasons of Belief"
This episode definitely has some Darkside cheese, but overall, I like it. It's Christmas Eve and the kids won't go to sleep. So Mom & Dad decide to tell them the story of The Grither - a monster headed right for their house from the North Pole. The sense of dread builds as the story progresses, which is nice, but the ending is a bit expected and abrupt. Worth seeing if you can catch it, though. Tales From The Crypt: "And All Through The House"
I love this. 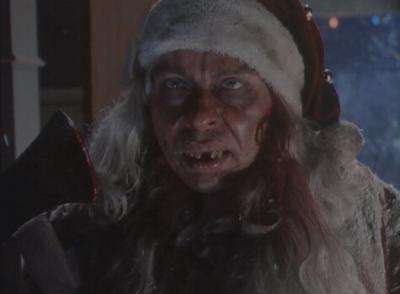 Silent Night Deadly Night wishes it could be this episode of Tales From the Crypt. I'm a big fan of the original comic story (from the Vault of Horror - not Tales From the Crypt) - especially the Johnny Craig art - and this version definitely does justice to the original. The same tale was tackled for part of the 1972 Tales From the Crypt movie, but it's not as good as this one. Highly recommended for any sort of Christmas gathering. 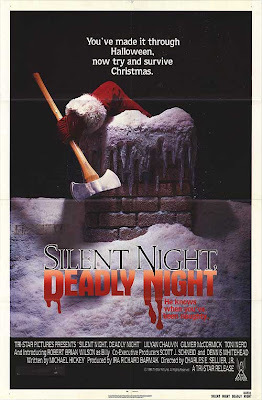 And here we go, back to the beginning - The original holiday slasher film! Actually, it's not that Christmasy, but it is pretty creepy, even after 34 years. I never saw the remake, but I'm fairly confident it's not as good as the original. 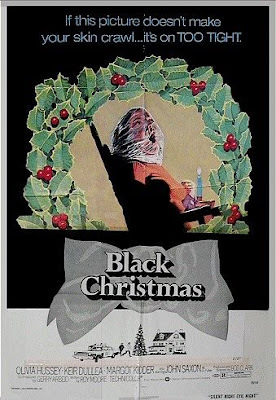 If you haven't seen this one, do yourself a favor & rent it before the holidays roll around again. For extra impact, be sure to watch it alone, at night, in a big dark house.